Heat oven to 350°F. Line cookie sheet with cooking parchment paper. In medium bowl, stir Bisquick mix and hot water until stiff dough forms. Let stand 10 minutes. Meanwhile, in 8-inch skillet, cook beef over medium-high heat 5 to 7 minutes, stirring occasionally, until thoroughly cooked; drain. Stir in salsa, raisins, olives, cumin and cinnamon; set aside. Place dough on surface sprinkled with Bisquick mix; gently roll in Bisquick mix to coat. Shape into a ball; knead 10 times. Roll dough into 13-inch round. With 3-inch round cutter, cut dough into rounds. Gather dough scraps together and reroll to 1/8-inch thickness. Cut to make 20 rounds. Spoon 2 to 3 teaspoons beef mixture onto center of each dough round. Fold dough in half over filling; press edges firmly with fork to seal. Place 1 inch apart on cookie sheet. 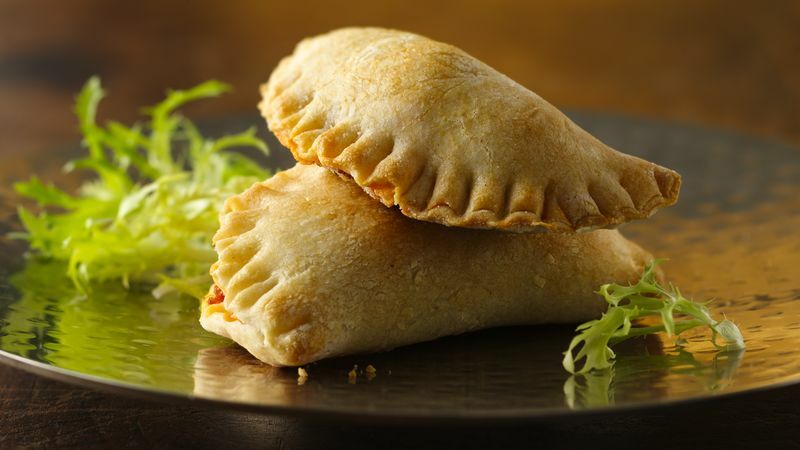 In small bowl, stir egg and 1 tablespoon water to combine; brush mixture over tops of each empanadita. Bake 14 to 16 minutes or until golden brown.